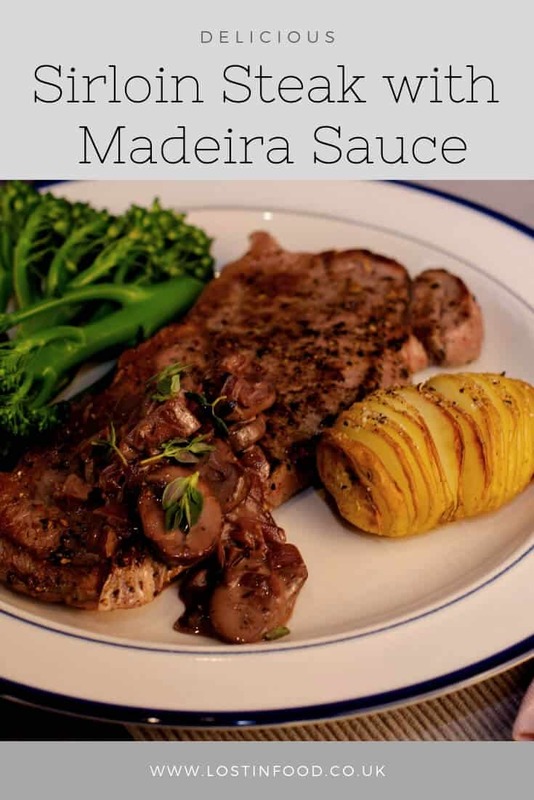 Sirloin steak with a simple mushroom, shallot and Madiera sauce. A beautiful main course for an intimate dinner for two or for a special meal with friends and family. 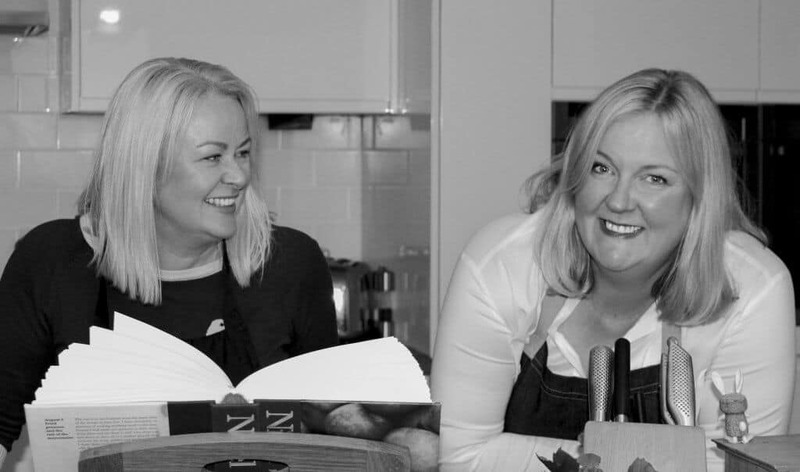 The next instalment of our special Christmas menu focuses on the main course. We both love to entertain, but particularly so over the festive period when we spend time with our family and friends. 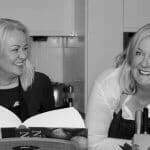 We love cooking Christmas lunch, however often prefer the other special meals that we cook around the festive period as they tend to allow us all a bit more time. 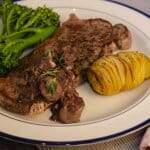 This steak dish is one that my husband loves me to cook. He not keen on mushrooms as a rule, but will happily eat them in this sauce aside a nice medium rare steak. Although this recipe is for two people it can be easily multiplied to feed a larger gathering of family and friends. We would recommend however, that you use a cut of steak like sirloin or a rib-eye. These cuts have naturally more fat in the steak and it’s this fat that renders down and gives the sauce all it’s flavour. By all means use fillet, but you won’t get the same intense meaty flavour. The sauce is rich with wine and cream, therefore we like to keep the sides simple. Pairing it with some steamed broccoli and simply cooked potatoes. Also the sauce itself is laden with mushrooms therefore treat it as another side dish, rather than a simple sauce. If you don’t have a bottle of Madeira don’t worry, you can easily substitute with a good red wine and reduce it just the same. However I always have a bottle of Madeira handy at this time of the year, it finishes a gravy or sauce beautifully. If you like this recipe then try our Steak with a Warm Spice Marinade or our Pan-fried Chicken with Smoked Bacon & Beans. 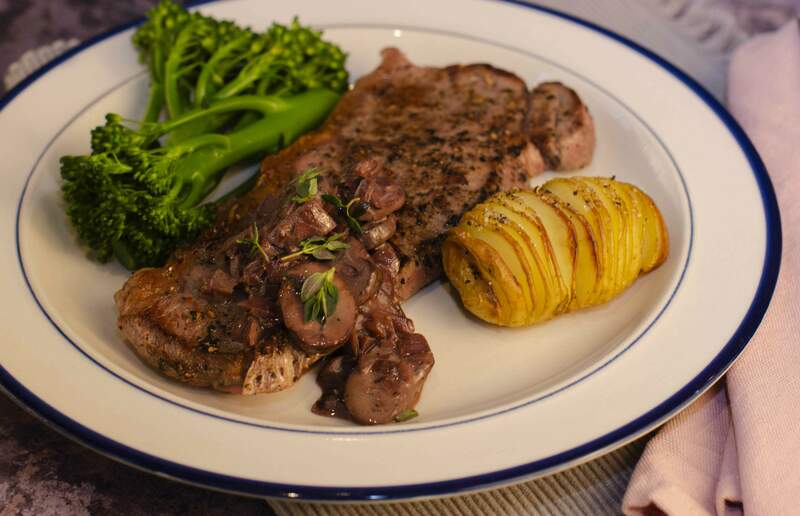 Our thanks to Donald Russell for kindly supplying the steaks for this recipe. Heat a large frying pan to searing hot and add the sunflower oil. Season the steaks on both sides with salt and a generous crack of black pepper and place in the hot pan. Turn the steak once to cook both sides. Cook till internal temperature has reached 45-47C for rare, 50-52C for medium rare or 55-60C for medium. Remove from pan and set aside on warm plate to rest the meat. Meanwhile lower the pan to a medium heat and add the butter. Once the butter has melted add the mushrooms, shallots, garlic and thyme leaves. Cook in the pan, stirring gently for around 4 minutes. Add the Madeira to the pan and turn the heat up. Deglaze the pan using the Maderia and reduce the wine by 2/3rds. Add any resting juices from the steak back into the pan. Stir the cream through the sauce and check the seasoning. Serve immediately with the rested steaks. 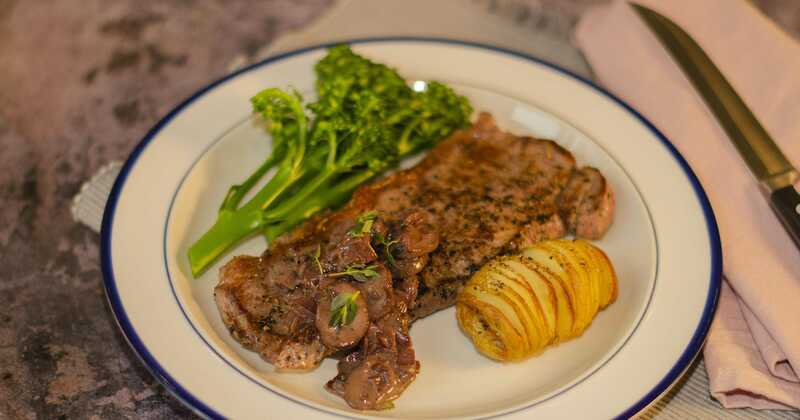 Sirloin steak is used in this recipe as the fat on a sirloin steak adds great flavour to the sauce when rendered down a little. However feel free to substitute with any cut of steak. Madeira wine can be substituted with a good quality red wine.